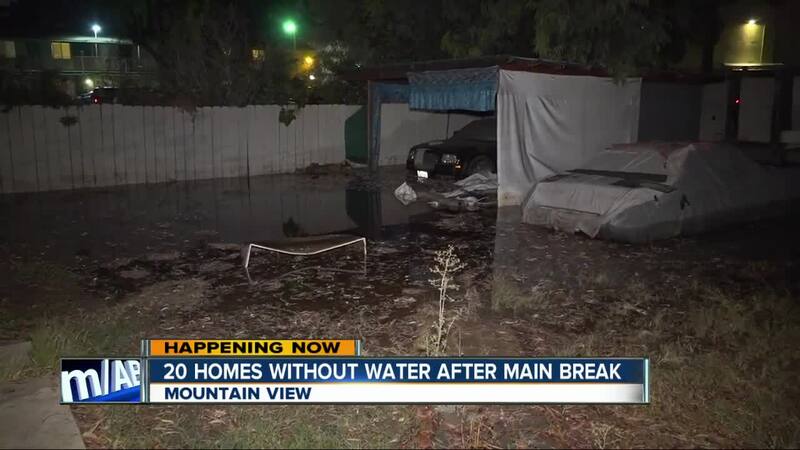 SAN DIEGO (KGTV) - A water main break in the Mountain View area left at least 20 homes without water service. Water workers told 10News a 12-inch main broke in the 4500 block of Delta Street just after 8 p.m. Tuesday. The cause of the break is unknown. The rupture and subsequent repair work caused water service to stop for at least 20 nearby homes. As of 5:30 a.m. Wednesday, the affected homes remain without service with no timetable for restoration. The break sent water, sand and loose gravel into the street, causing some damage to at least one home. There is no immediate word on when repair work is expected to be completed. Earlier this year, a water main broke and formed a sinkhole on the same street , swallowing a pickup truck and flooding the street.